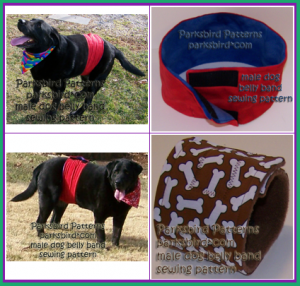 SEW a Male Dog Belly Band Diaper and Dog Bandana !!! What’s great about this is that it’s (1) easy to sew (“Even absolute beginner sewers can make this belly band and matching bandana [sic] in LESS THAN ONE HOUR!”) and (2) matching — you can make a belly band AND a bandanna, basically a whole outfit, so nobody sees your dog and goes “Why does that dog have a belly band on? He must be one incontinent dog.” Instead, their eyes are drawn to the bandanna, and they figure it’s a whole outfit. On the other hand, thinking about incontinent dogs who need diapers leads to sadness. Now I feel cheap. Our elderly dog (long since gone to the land of the dear departed) had exactly that problem and when he was indoors we just tied a towel around his waist. Shame on us. I’m glad we saw this. A couple days ago, we had to take baby diapers and elastic to improvise for our dog.